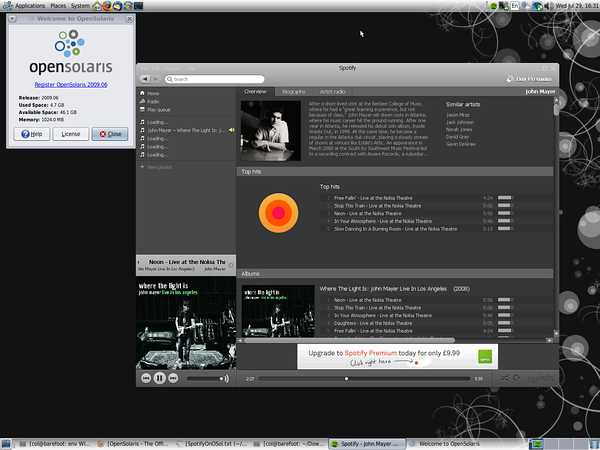 I'm please to announce folks that you have one less excuse to use Linux in favour of OpenSolaris... you can now run Spotify on OpenSolaris, granted not natively, but in the same way you can on Linux: with Wine. Upgrade your OpenSolaris release to the latest and greatest, which at the time of writing is snv_118 using either the CLI (pkg image-update) or the Update Manager GUI. Install Wine as per the details on the Wine wiki. You can use either the Wine source code tarball or the latest git sources (which I used). Do NOT try and use the prebuilt Wine in the contrib repository as it does not have sound or network support - both of which are needed by Spotify. Start Spofity, login and start listening. There are details about on getting it working on earlier releases of OpenSolaris, and prebuilt pkgs available too if you don't want to live on the cutting edge, but I do, so I've gone with the cutting edge method :-D .